For the experienced traders, they know there is no holy grail in the business of trading. They also know the trading business is a long term grind, not a game of hitting the jackpot. In order to stay in the trading game, one must have a systematic approach for deciding when to enter a trade and when to exit a trade. It is the systematic approach that gives the trader the ability to establish consistency. Without consistency, a trader cannot attain consistent profitability. And without consistent profitability, the trader will not have confidence to believe it can win at this game of 'trading'. Here is a video illustrating how to apply technical analysis for setting up a trade for FB. Click here to view the video if you do not see the video player on your screen. The market continues to move into new high territory. The Dow Jones Transportation has been making new all time high for nine consecutive days, the SP500 has been making multi-year high for the last eight trading sessions, and the Dow Jones Industrial has been closing higher for six consecutive days and making new 52 weeks high. The small cap Russell 2000 also been making all time high. The only index that have not been making new 52 week high is the Nasdaq 100, and it is primary being weighted down by the weakness in AAPL. As the market making consecutive new high, one should not be surprised if the market pulls back before its next upward move. But it would be unwarranted to expect anything more than a pullback at this time. The message from the market is continue to wait for DJI to make a new all time high, and then watch for signs on where the market will likely headed. Until then, keep an eye on the Dow Jones Transportation. Here is a chart showing the advance-decline line continues to rise as the SP500 makes new multi-year high. In addition, the new high-new low has not contracted. After reaching a price level slightly above 32 in January, FB pulled back to previous support level near 29.50. Now it appears to be ready to make another upward move. The measured move from the recently formed bull flag seems to indicate a potential price target near the 36 range. AAPL put out a disappointed earnings report and the stock is down almost 10%. Here is a video reviewing the price actions and taking a look at where are some possible support levels for AAPL. In addition, a review of the market along with post earnings report price actions from GOOG, IBM, and NFLX. This week, GOOG, AAPL & IBM will be reporting their earnings. 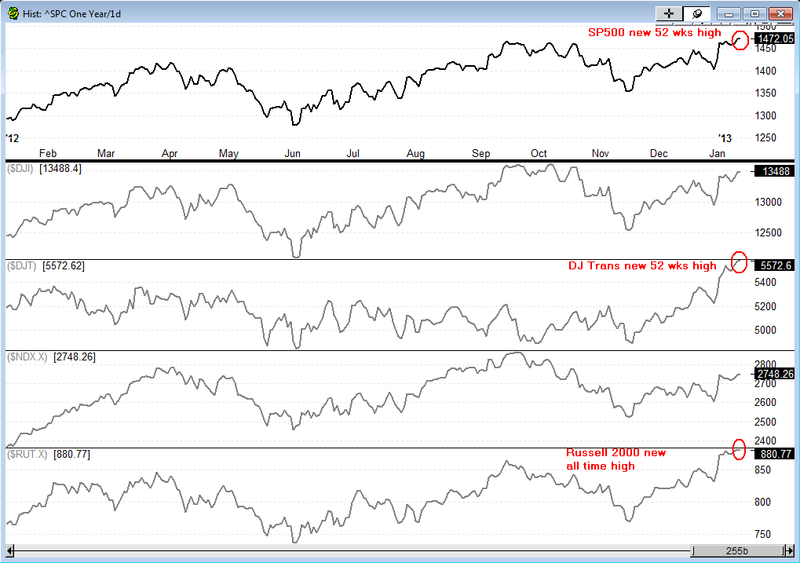 These three market moving stocks have been acting weak recently and appears to have reached support level. If these stocks act favorably after their earnings report, the market will likely to continue to make new high. Click Pre-Earnings For GOOG, AAPL, IBM to view the video if you do not see a video player on your screen. The market continues to head higher. The DJT and the DJI are confirming on the 52 weeks basis. The SP500 also continue to make new 52 weeks high as the Russell 2000 making new all time high. The only index that is lagging is the Nasdaq 100. AAPL is the big factor that is holding the NDX down. 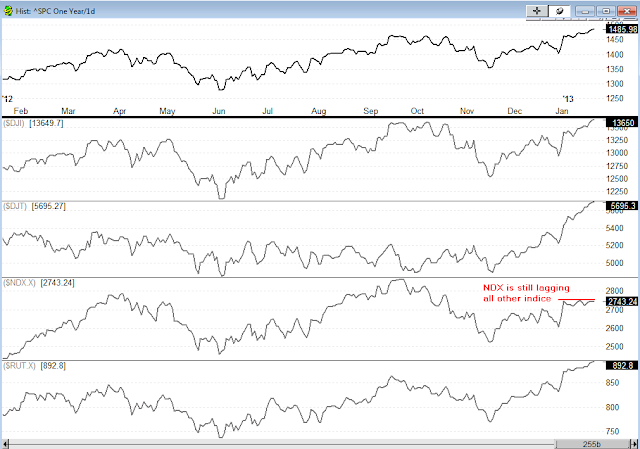 The NDX could move higher if AAPL & GOOG react favorably after reporting their earnings this week. Here is a one year closing chart for the indices. 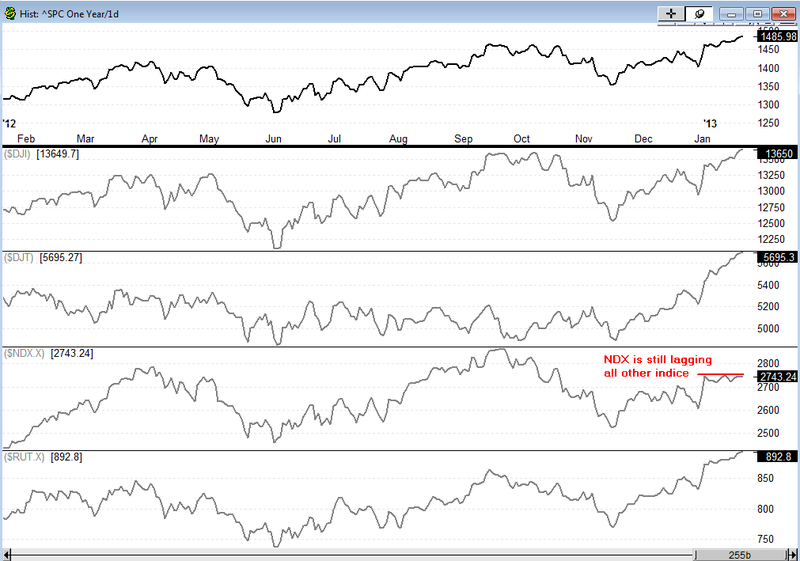 As the chart shows, the NDX is still a distance below its 52 weeks high. Here is a brief and simplistic description of the Dow Theory. The Dow Theory is based on two major Dow Jones indexes, the Industrial and the Transportation. The behavior between these two indexes will indicate the different market stages (economic cycle). At the beginning of a new cycle, the Dow Jones Transportation will make a new high without being confirmed by the Dow Jones Industrial. Then the next stage, both indexes will jointly make a new high. And in the final stage, only the Dow Jones Industrial will make a new high. From this description, the Dow Theory is simply a progression of non-confirmation, confirmation, and non-confirmation between the Dow Jones Industrial and the Dow Jones Transportation. Today's new high made by the Dow Jones Transportation signify it is in the first stage of the Dow Theory. In the next stage, the Dow Theory indicates there will be a new high from the Dow Jones Industrial. If that is the case, see this post “The State Of The Market” for clues on where the next new high for the Dow Jones Industrial might be. The measured move price target for bull flag and bear flag pattern is based on the "symmetrical move". 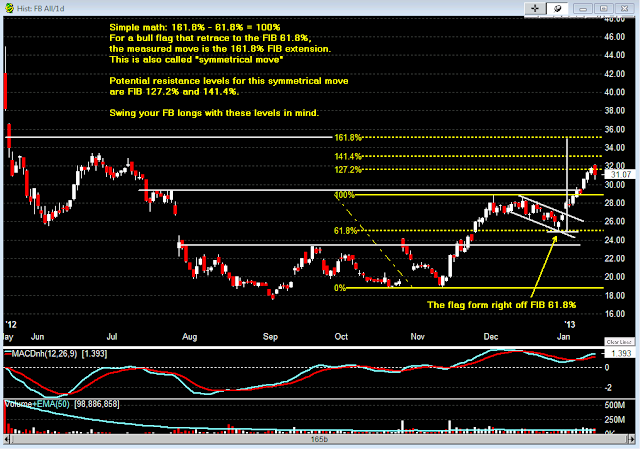 Here is a chart of FB illustrating the potential symmetrical move established by the bull flag in conjunction with the Fibonacci retracement levels. Recently, there has been lot of talk about the market nearing a top and a major pullback is imminent. That might or might not occur, but for ill-informed people to misquoting market indices historical high is a disservice to their audience. The fact is only the Russell 2000 has made a new all time closing high, not the SP500, not the Dow Jones Transportation, not the Dow Jones Industrial, and not the Nasdaq 100. So where is this market going? No one really knows, but one can only decipher the messages the market sends out and attempt to get some clues on where it is heading. What the market telling us is sit tight and watch the Dow Jones Transportation and the Dow Jones Industrial index. When either one or both of these indices make a new all time high, watch what the Dow Jones Industrials is doing. These two indices will give us clues what the next new all time high from the Dow Jones Industrial will signify; top or higher high to come. The market will repeatedly play out this scenario according to the Dow Theory. If you are not familiar with the Dow Theory or like to learn how one can apply the Dow Theory to read the market messages, search my blog using keywords ‘dow theory’. In the meantime, let's see which index will reach a new all time high first, Dow Jones Transportation or Dow Jones Industrial. The Russell 2000 already gave a clue where the market might be headed. Pay attention and keep watching the market for subtle messages. The market might be deceptive, but it always shows us what it did and what it might do. 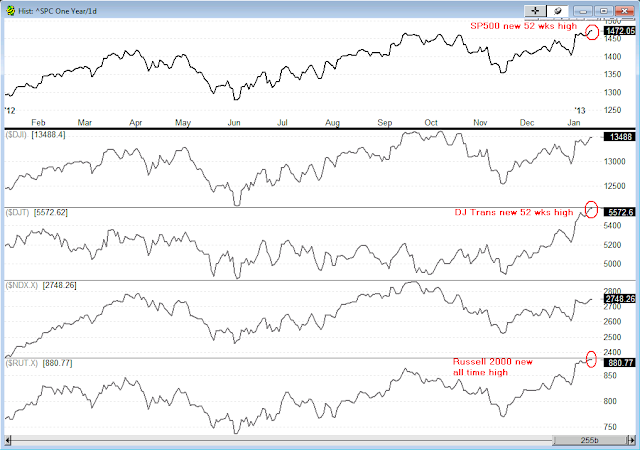 Below is the chart showing the one year closing level for the SP500, DJI, DJT, NDX and RUT. AAPL continues to be a trading stock while it attempt to consolidate. Unless you are an active trader, you will likely get chop by AAPL’s recent volatile price actions. From the above daily chart, the 525.62 closing low on 11/25/12 turns out to be the start of the current positive MACD divergence. In addition, the 505.75 low made by the long wicked hammer doji candle on the following day appears to be the floor for future prices to penetrate. So far, three attempts; 12/14/12, 12/17/12 and 12/27/12 when the price moved below the 505.75 level, all three times the price bounced back and closed above it. More importantly, the closing price on 12/28/12 is 20 cents lower than the 12/14/12 close while the MACD held a higher level on 12/28/12 than on 12/14/12. This is another sign of continuation of the positive MACD divergence. This MACD divergence could end up simply being an indication of a pause in the current downtrend, or it can be a precursor to an uptrend. In regardless, the recent price actions along with the MACD divergence should be taken as an alert to lighten up any existing short positions and resist from initiating new short positions until it has closed below the 505.75. For the active short term traders (day traders), it would be more prudent to focus on setup to go long than to focus on setup to go short as the 505.75 appears to be the support level until it has been breached. Until the price has closed above the 1/2/13 high of 555 to establish a higher high and a higher low with prices hold above 12/28/12 close of 509.59, resist from initiating new swing long position unless you consider holding a position overnight is a swing trade. Until then, continue to exercise patience. Caveat: If the price closed below 509.59 prior to closing above 555, then the long bias will no longer hold. Here are some stocks might be worthwhile watching for the upcoming week: GOOG, GS, MS, NFLX, FB, GLD. Click on this link to view the video if you do not see a video player on your screen. After the US congress passed a bill to avert the fiscal cliff crisis on New Year's day, the market exploded to the upside on the first trading day of 2013. As all good leading stocks do, AAPL helped on lifting the market by open strongly. But it quickly ran into the 555 resistance level and pulled back. Although it held the opening gap, but it is encountering resistance at 549. 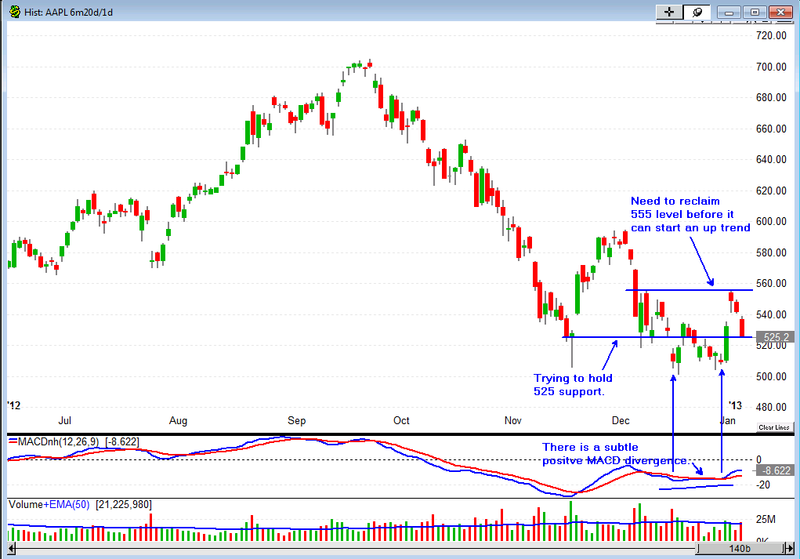 During the last month of 2012, AAPL appears to be establishing a support level near the 505 to propel it to regain some of its recent losses. AAPL has the potential to reach the 595 in the near future if it reclaim the 555 level. Here is a video reviewing the recent price actions and price levels for $AAPL to hold & reclaim in order to continue its upward move in the near future. Wishing everyone a Happy, Healthy and Prosperous 2013!